A week or two ago, when I wrote a post criticizing a YouTube Video called “Chairs”, I also spent some time online reading everything else I could find by the creator, Rick Atchley. Among other items, I discovered this fascinating interview. Back in the 80’s you could go to any major city, especially in the South, and you could find a progressive Church of Christ — and if they would preach grace, and if they would put words on a screen, and if they would let divorced people place membership, they would grow. The generation of Boomers has enough denominational loyalty that they’re going to find the least legalistic Church of Christ they can find, and that’s where they’re going to attend. Well, we discipled the children of those progressive churches for a whole generation to grow past us Boomers. They never heard the sermons we heard. They never heard the rationale for a cappella music. We sent them to youth rallies and Church of Christ events with some of the finest Christian bands in the world. We discipled our children to leave our Movement! This is particularly ironic, coming from a man who sneers at slippery-slope arguments. Not only does he himself represent the slippery slope in action; he has observed the slippery slope in action on a brotherhood-wide scale. It makes sense that a more progressive church of Christ would appeal to some. After all, what makes them progressive is that they demand less. “Preaching grace” is code for “not preaching on authority”, which abolishes the stumbling block that stands between the churches of Christ and the wider evangelical world. Now your faith doesn’t require you to argue with your friends! Similarly, “letting divorced people place membership” is code for “ignoring Matthew 19 and 1 Corinthians 5”. After all, my own congregation certainly allows divorced people to place membership and indeed rejoices when they do so. The sticking point is that they must come in on God’s terms and not theirs. A progressive church of Christ, a church that bends these rules, is going to be filled with people who care about the name on the sign but aren’t particularly concerned about following the pattern of sound doctrine. This is, of course, exactly backwards. A church can belong to Christ without having a sign that reads “church of Christ”. I doubt the first-century Jerusalem church had a sign. However, what the first-century Jerusalem church did have was devotion to the apostles’ teaching—all of it, not only the culturally palatable parts. Yes, John 13:35 describes one of the identifying marks of the true church, but so does John 8:31. 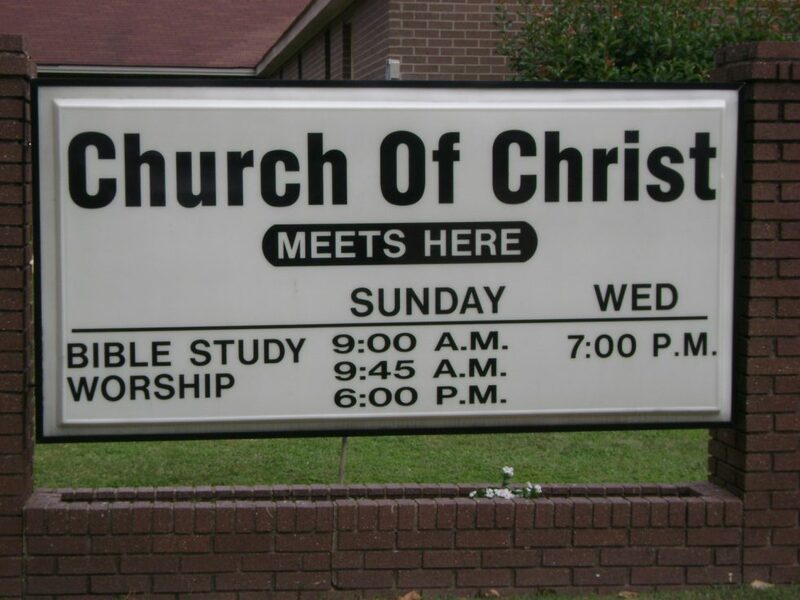 A church that has the right sign but not the right doctrine has the worst of all possible problems. If the light that is within you is darkness, how great is the darkness! Additionally, clinging to the name “church of Christ” while abandoning submission to Christ’s authority simply isn’t a stable place to be. It’s based on nothing more meaningful than sentimental attachment to an outgrown label. As a result, the decline Atchley describes is inevitable. The more like the world the church becomes, the less reason there is for anyone to prefer the church over the world. People who grow up never hearing a sermon on instrumental music or Bible authority have no reason not to worship at the evangelical church of their choice, regardless of what the sign says. For that matter, they have no reason not to worship at the crazy left-wing church of their choice. If God’s word doesn’t speak authoritatively about worship, why would it speak authoritatively about the practice of homosexuality? Once we start saying “I get to decide that this commandment isn’t important,” our rejection of other portions of God’s word is limited only by our preferences. The problem is not that people who do this have left “the Church of Christ” (whatever it might be). It is that they have left Christ. The outcome here is a familiar one. It is the world of Judges 21:25. This doesn’t necessarily mean depravity for all. Some people enjoy feeling virtuous. They want to be churchgoers. They want to hear the parts of the counsel of God that they like. However, because they aren’t seeking the whole counsel of God, they demonstrate that they put the most importance not on God, but on themselves. Atchley is pretty direct about adopting such a philosophy. In his discussion of the “worship wars”, he is entirely concerned with human preference and not at all with the Scriptural witness on the subject. In his view, his church should do whatever will get the most people through the doors. Honestly, I wonder if he has spent much time recently considering Proverbs 16:25. Judges 21:25 is one alternative. Colossians 3:17 is the other. If we believe that it is important to obey God in anything, it logically follows that we must obey Him in everything. Complete submission to God is not a popular choice. It never has been, with good reason. It will require us to give up things that make us happy. It will set us against our friends and even our families. However, reverence for God’s law has two important consequences. First, it protects us from ourselves. Only if we acknowledge that God’s way is best will we avoid the problems that He sees and we don’t. I don’t have to understand. I only have to understand that God does. Second, it’s the only way to find favor with Him. It is not those who say, “Lord, Lord!” and put the right name on the sign who will enter the kingdom of heaven. It is those who do the will of the Father in heaven who will enter. May all of us be in that number!